My Texas brother in law has a house. He and his family are very welcoming people they don’t have an official sign to welcome everyone into their home. I decided to rectify that. 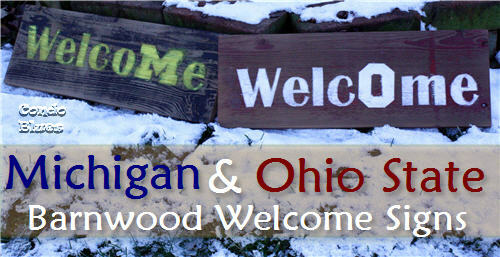 I made him a University of Michigan welcome sign because my brother in law is a big Michigan fan. How I don’t know. He was born and lived in Ohio for most of his life where you are supposed to root for Ohio State University from birth. I guess he gets away with it because his family does not live in Ohio anymore. While we are talking team rivals, I figure I should even things out on the sports front and make an Ohio State University welcome sign for Mother and Father in Law’s new house while I was at it. On my first attempt, I made a freezer paper stencil and tried spray mounting/ironing it to the wood sign just as I did with my Avengers Assemble sign. My paint seeped under the stencil because the stencil didn’t adhere properly to the rough wood. 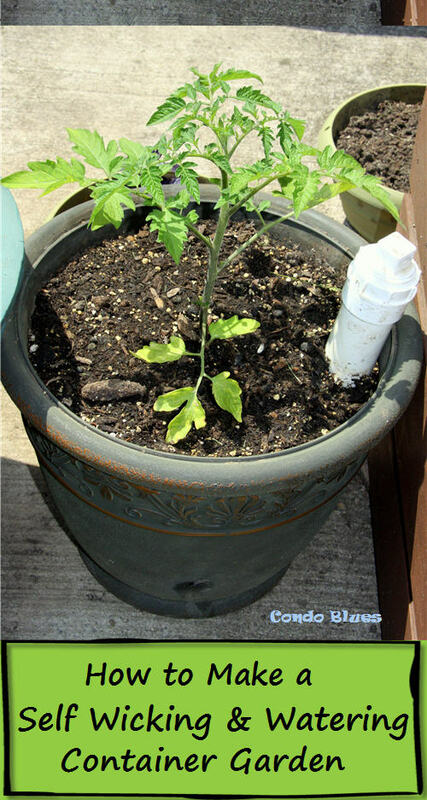 Not every project comes out the first time. I broke out my Mouse sander to sand down the mistake, made a new super sticky stencil from contact paper, and stenciled it with light coats of spray paint instead of canned paint. Lucky for me the second time was a charm. 1. If needed use the saw to cut the wood to size. I used a compound miter saw but a handsaw, table saw, or circular saw works too. 2. Paint the sign with the appropriate color watered down paint. You may want to use more than one coat of paint. I used watered down paint so the paint will seep into the wood like a wood stain. 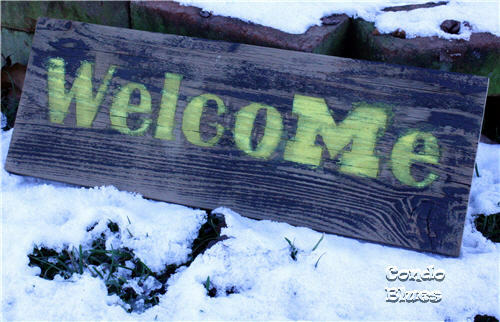 If you want a less rustic look, sand the wood first following Steps 3 and 4 and then paint the sign with full strength paint. 3. Sand the front side of the board with the sander and 80 grit sandpaper while wearing your safety glasses and dust mask to knock down any roughness and ridges in your wood. This is why we wear a dust mask folks! This was a brand new out of the package mask I used when sanding my signs. If I didn’t wear a dust mask while sanding, this dust and more would be in my eyes and lungs. Sanding without a dust mask over time can cause serious health problems. Please wear the mask, OK? 4. Sand the front side of the board smooth with the 120 grit sandpaper while wearing your safety glasses and dust mask. The wood doesn’t have to be perfectly smooth, just smooth enough so the stencil will stick and the paint won’t seep underneath. 5. Cut the contact paper the length of your sign with the scissors. 6. 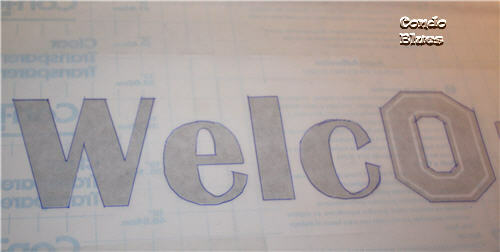 Place the contact paper over your Welcome printout and trace the letters with a pencil onto the contact paper. I used the Michigan M in Welcome for the Michigan sign. 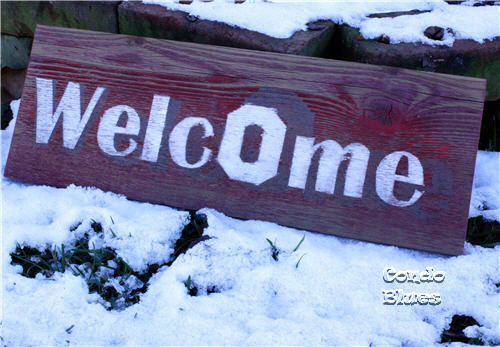 I used Ohio State’s Block O in Welcome for the Ohio State sign. I used clear contact paper to make lining up the stencil easier in Step 7. Note: These signs are for personal use. 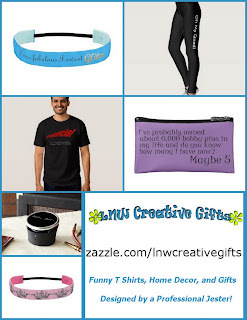 I cannot sell them at a craft show, etc because college logos are registered trademarks. You have to have approval and pay the university for the privilege to sell anything with their trademark on it. If not you can be fined, arrested, or make the school just plain mad and rightfully so! Sure, the university makes big bucks from licensing their trademarks, but in the case of OSU (I’m not sure about other schools,) the money they make from licensed goods funds academic scholarships. 7. Remove the backing from the contact paper. 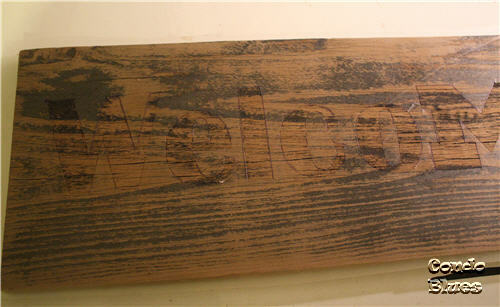 Place the uncut stencil onto wood sign and use the bone folder/brayer/card, etc. to firmly press the stencil to the wood and remove any air bubbles. 8. Use the craft knife to cut the traced letters from the contact paper. Don’t worry if you slightly cut into the wood, it will create a design element and keep paint from seeping from underneath the stencil. 9. 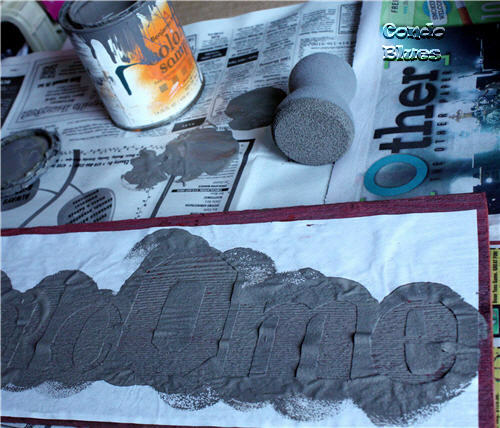 Paint the stencil with several light coats of spray paint in the appropriate color. I got two different looks because I used regular yellow spray paint for the Michigan welcome sign and white paint plus primer for the Ohio State welcome sign. There wasn’t any rhyme or reason why I used one type of spray paint over the other except I used what paint I have on hand for this project. 10. Remove the stencil from the sign while the paint is still wet to help prevent seeping. 11. I sprayed both signs with matte spray sealer after the paint dried because I used craft paint for the backgrounds of each sign. I could have skipped the sealer step if I used outdoor paint for the whole project. 12. Attach two saw tooth hangers to the back of the sign. 13. Hang it up and welcome your fans home! 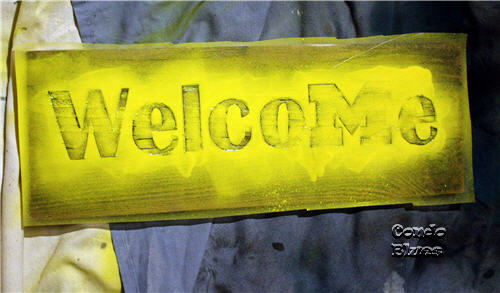 If your school or team doesn’t have a logo that will work as a letter in Welcome, you can make a sports team welcome sign by painting it in your school or team colors. The signs where a hit! Very cute! I am on the look for old barn wood!